In the year 2045 A.D. the 37th Long Range Emigration Fleet - MACROSS 7 - proceeds on its mission to the center of the milky way. The headquarters of the Fleet are located on the 7th battleship 'MACROSS' class . Along the way the Fleet encounters of the Barauta. And then in the following year, 2046 A.D. In a sector of the combat zone the story begins.. Note: This series is very different from the rest of the Macross series. Its plot is not focused on space combat; in fact mechas don't appear in the story at all. 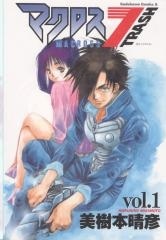 Instead the story revolves around a sport called "air blading" (it's pretty similar to the Airgear manga), using the Macross universe as a context.